The days of Tobias ruling the roost in Freeland are over! 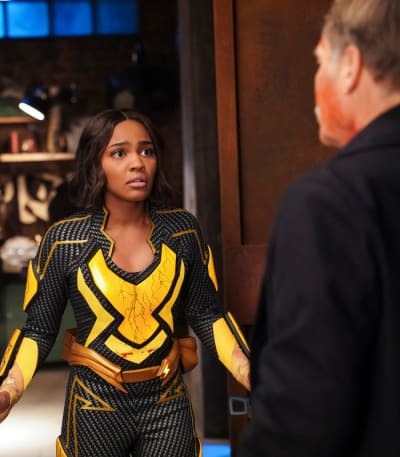 Black Lightning and the team finally defeated their longstanding foe on Black Lightning Season 2 Episode 16. The defeat was two years in the making! It goes to show that we need to take the foreshadowing seriously. All of the warnings he received from his own accomplices came to fruition in the most satisfying of ways. I didn't think we would see this moment any time soon. Tobias' fall from grace stemmed completely from his own mistakes. His desperate need to defeat Black Lightning and create chaos in Freeland led him astray until the heroes gained the upper hand. After weeks of staying behind the shadows, his final few moments on the top showed a hot-headed man who would only cause his own destruction. Tobias had all the pieces needed to win. He had the MODs, the Green Light pods, the 100, Cutter, and a never-ending path of influence over the people of Freeland. He simply needed to bide his time until the right moment to strike. But, as the weeks went on, a mentally-fragile and egotistical man emerged that had the potential to doom everyone and everything he planned for. Cutter had every right to be worried; his conversations to Tori's painting showed a warning sign of his fractured state. Even Dr. Jace warned him that he needed to be smarter and cautious with his actions. Tobias should've listened to someone and slow down. Whereas Black Lightning benefitted from the partnership with his loved ones, Tobias going it alone fed off his paranoia and unrestrained anger. That power trip doomed any chance he had of winning. 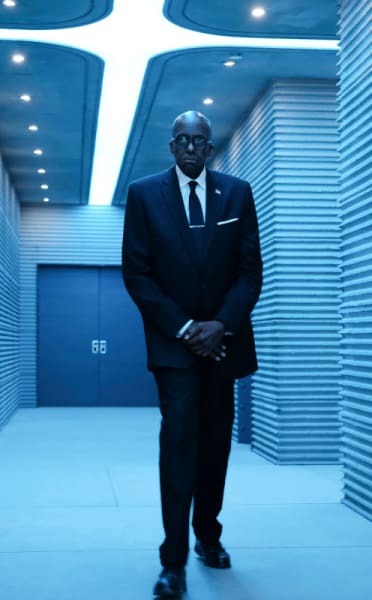 While it's sad to lose Tobias Whale to the confines of The Pit, the leader being captured was the best thing to happen to Black Lightning's story. As of "The Omega," the group fought two seasons-worth of battles against Freeland's mob boss. A few one-off baddies and arcs appeared, but for the most, Tobias served as the main antagonist. He kept winning and evading capture while the heroes had to regroup for another day. 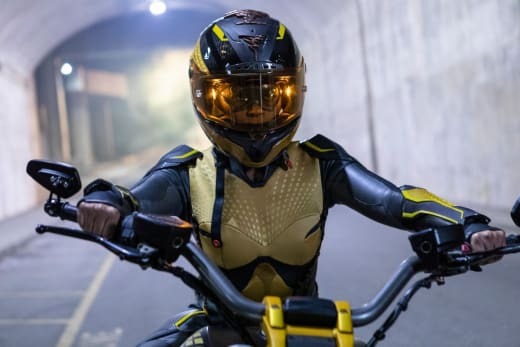 If the same format progressed into Black Lightning Season 3, the story would eventually become stale and utterly redundant. Seriously, how many times could Black Lightning/Thunder/Lightning stop one of Tobias' plans until it became same-old-same-old? Even Batman fights other Big Bad supervillains in between his battles with the Joker. The weight of a storyline is defined by the stakes of winning or losing; if there are no real stakes, there is no urgency to follow it. This is an issue that plagued Black Lightning Season 2. 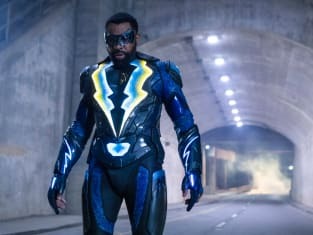 Hopefully, Tobias takes a break to give Black Lightning time to battle a new enemy before returning for an epic revenge plot. We want him back, but this relationship needs a break. Speaking of a break, I shockingly felt bad for Cutter. 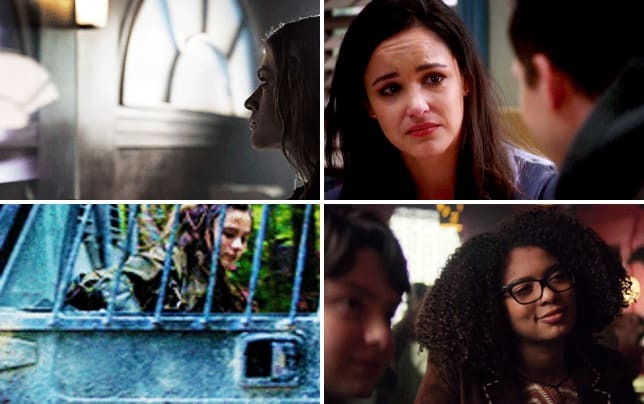 You could tell that her breakup with Tobias was hard for her. She loved him and wanted to make it work, but his toxic behavior was too much to handle. Either she would go down with the ship or she would have to save herself. Ultimately, she made the right call. Tobias would only ever protect Tobias if things came down to it. And his desperation to defeat Black Lightning threated to destroy them all, as well as her. There was nothing she could say or do to change his mind. Leaving him gave her back the power to set her own path, and that smart thinking saved her life. 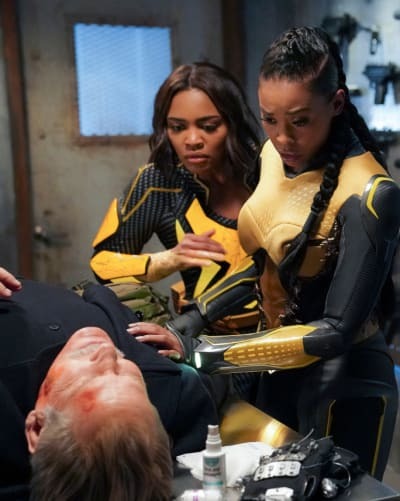 Black Lightning Season 2 Episode 16 gave us two big battles that relied on the heroes using their fighting and metahuman abilities. I'm a sucker for a good fight scene ... and these two didn't disappoint! Jennifer's naming scene as Lightning suited her character's personality; she mixed in cheeky wit and devastating power to showcase her strength. Tobias didn't know what hit him when she burst her way into the penthouse. And from the way Jefferson reacted to her electricity when trying to stop her, Tobias must've been in much more pain. Though, when Black Lightning fought Tobias and knocked him out, the scene had a sense of long-awaited joy. Jefferson waited for decades to get revenge on his father's murder. Him being the one to defeat Tobias created a satisfying and momentous ending for this chapter in his life. He no longer has to look back in fear; this is his moving point toward the future. In the case of the Masters of Disaster, I love whenever Thunder and Black Lightning battle against an evenly matched foe. There were obvious stakes in this fight since the MODs could've easily killed them if Lala hadn't shown up. New Wave, Coldsnapp, Shakedown, and Heatstroke all played for keeps in this fight. At times, I wondered if the MODs were going to win since they had the heroes pushed to the brink. That's how you choreograph a fight that's both exciting and tense! Though, the special effects needed a bit of work; in particular, New Wave's water bubble that trapped Thunder. The bubble looked too much like CGI. On the other hand, I wish we would've had more time with the MODs. 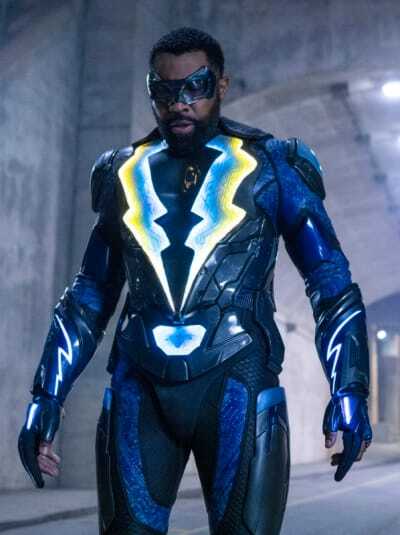 The fight scene breezed through pretty quickly once Black Lightning got his powers back, and when Heatstroke got shot to death. Everything got wrapped up in a pretty bow to move things along. In a longer season, the MODs would've been developed more to focus on each character and what trouble they caused in Freeland. Instead, we only had a group fight scene, which was a lot of fun, but there could've been a lot more to push this villainous plot. Jennifer was lucky that her loved ones risked their lives to protect her. Had they not shown up when they did, she could've died or done something she would eventually regret. Gambi explicitly told her that if she didn't rein in her powers, the energy would over surge and hurt her. And true to his karmic words, that's exactly what happened in her first encounter with Tobias. Her continued struggle of "mind over matter" looked ready to be her undoing. But, what "The Omega" positively did for Jennifer's character development was to teach her the error of her ways. In addition to that, she learned, listened, and followed through with those lessons ... for the most part. Who knew a combination of an overpowered fight, Gambi nearly dying, and Perenna knocking some sense into her would be the trick? Jennifer acted like a more responsible person after experiencing the pain she caused. She wasn't going to rush into battle without practicing or knowing the extent of her limits. That change made all the difference for how the later events played out. I've said this before, but ... we could be seeing the start of a new Jennifer Pierce. In particular, her heroic side emerged from the darkness in a blazing glory of light. When Freeland fell into chaos, the old Jennifer would've stayed out of the action and protected herself first. Here, Jennifer wanted to be part of the fight and use her powers for good. That inner monologue for wanting to make a difference triggered a hero spark in her that we've waited weeks to fully form. Without her involvement, Freeland wouldn't have received its power back nor would Tobias have been captured. Good things happen when Jennifer has a calm head and uses her abilities for the right reasons. The perfect symbolism for this change in Jennifer manifested when she glowed in Gambi's car and flew away. 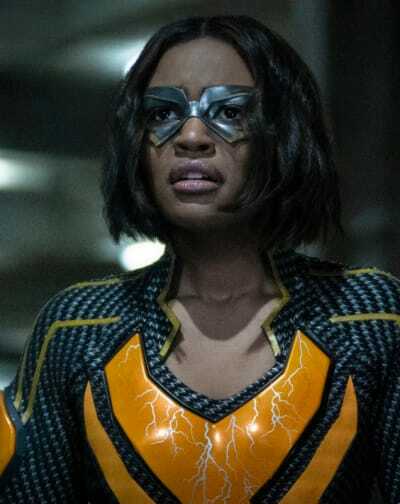 While she originally planned to use her powers for a bad reason, that scene represented a mature and determined "Lightning" coming into her abilities. Jennifer finally embraced herself and made a decision that, while not completely good, was something fueled to help the greater good. Gambi's awestruck expression summed up the magnificence of this moment. The release of the pod kids will no doubt cause a lot of chaos in Freeland. 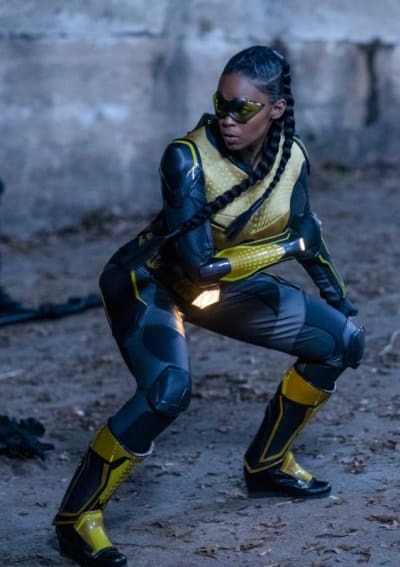 As we learned from Black Lightning Season 2 Episode 2, the pod kids can be volatile once they're freed from the pods. Their dazed and docile demeanors will only last for a short while before their senses come back to them. And when they're in full force, some of them might be holding a grudge. The influx of metahumans will leave Black Lightning and team busy for a while to quell any potential threats. Plus, if Agent Odell gets his hands on a few more of them, he might have the army he needs to take on the Malkovians. The fact that he had Wendy, Issa, AND Khalil already in captivity was a shocking surprise. Hopefully, we learn how he came to capture all three of the metahumans, especially the situation involving Khalil. Did you work with the doctor to fake his death? These are the cliffhangers we want to know. Agent Odell's reveal of the impending Malkovian War ended the season off on a powerful note. I loved how the editors gradually decreased the sound of the background music as Agent Odell discussed the war. The seriousness of the situation was emphasized to hammer in the point that the fun and games were over. Black Lightning's problems would soon extend on a global scale. Even though the scene lasted a few minutes, the tone held a lot of weight to it. You could feel how thick the tension became once Agent Odell appeared to break up the family fun. If his stone-faced demeanor is any indicator, we can expect this Malkovian war to be the group's toughest battle yet. And I can't wait for it! With all the new tattoos on Lala, there will be a lot more spectral victims appearing in the near future. I have a feeling he'll be driven crazy by all the extra voices. Perenna only had one scene and she still owned it like a queen! All the peasants need to bow down to her. Even though Dr. Jace got kidnapped by the teleporting bounty hunter, I think she'll be fine. She's a survivor who knows how to make it through tough situations. She'll probably debate her way into a high position the next time we see her. Anissa loves her role as Blackbird. Did you see her glee at owning up to her second alter-ego? She loves the rebellious quality that Blackbird gets to enjoy. What did you think of "The Book of the Apocalypse: Chapter Two: The Omega"? What will Agent Odell do with the remaining pod kids? Is this the last we'll see of Tobias? How will the Malkovian War affect Freeland?